Why have local video shops disappeared and been replaced by Netflix? Why are hotels being replaced by AirBnB? Why is Amazon the only company who can sell you the book you want to read? And why is there no Pepsi in cyberspace? They are all under the influence of Online Gravity, the unseen force driving the way business is done online, and changing the face of work and employment now and over the coming decades. 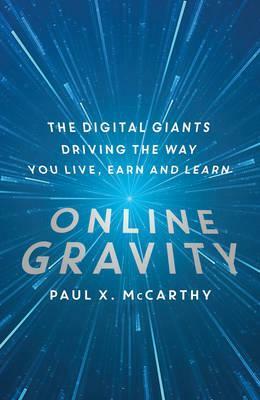 Online Gravity has formed huge planet-like companies which dominate the online business world and either eat up or blitz their competition. We all hear about jobs being replaced by technology. McCarthy, industry expert and big data analyst, shows that rather than reducing jobs, Online Gravity has replaced 2.6 jobs for every one lost. And while the phenomenon of Online Gravity is startling, it is entirely transparent and follows its own distinct set of rules and laws. McCarthy identifies the 'secret sauces' that have not only driven success for these companies but can help us - and our children - as workers and future business owners of the 21st century. In this must-have guide to negotiating our future in an increasingly digital world, he shows us what Online Gravity is and how we can harness it for our own success. Witty, pithy and full of astounding ideas, Online Gravityis not only a highly enjoyable read but an essential handbook for the decades ahead. Paul Xavier McCarthy is an observer of technology and its global impacts. He is Director of Strategy and Innovation at Sirca-a global technology company based in Sydney that provides online services for data-intensive researchers and analysts in financial services and other domains. Previously, Paul X. McCarthy was cofounder of several innovative technology and online services businesses for IBM, State Government, and CSIRO - Australia's National Science Agency and the inventors of Wi-Fi. McCarthy is Adviser and Adjunct Professor at the University of New South Wales School of Computer Science and Engineering and co-founder of MBA Analytics, a global talent discovery start-up. McCarthy received his Bachelor of Science in Computer Science and Graduate DipArts in Fine Arts both from the University of Sydney, where he won the Ian Langham.